Why do we need Spring Web Flow(SWF)? Why do we still need Spring Web Flow while we have good web frameworks already? Spring Web Flow(SWF) focus entirely on the definition and execution of complex conversation in a web application, i.e. web application page flow. To understand why it is a good solution, it is a good idea to start with the problem it tries to solve and the complexities involved in the solution. An example case is the shopping transaction which involves adding/updating shopping cart, providing buyer info, confirming order payment, etc. It has a clear web page flow, if there is no security problem. However, there might be problems like, jumping payment, refreshing pages, etc. SWF is a good solution for those situations. SWF can easily integrated with existing frameworks like Spring MVC, Struts, and JSF, in both servlet and portlet environments. 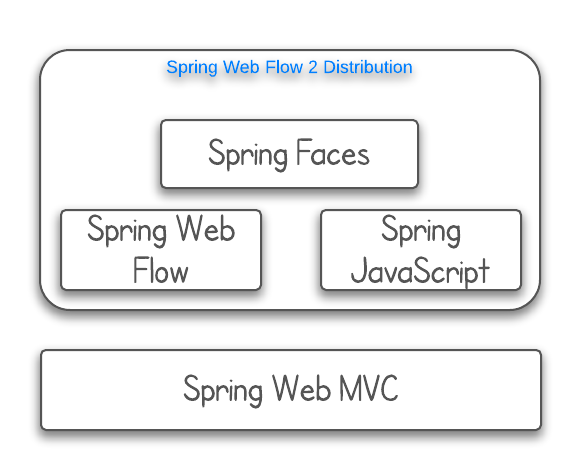 The relation between Spring Web Flow and Spring MVC is clear in this picture. Thank you for sharing such a wonderful information with us. The information you shared is very effective for learners. simple explanation easy to understand!! !